Before I go further, I should address some things to avoid when thinking about strategy. You can't predict the future, you can't detach planning and implementation, you can't be too formalized, and you must finish a strategy before it becomes obsolete. There are strong advocates (Mintzberg) of informal emergent strategy who let it flow more than they guide it, and there are more formal methods like Porter's generic strategies. Although many successful strategies have emerged without much planning, having a concrete plan will help find holes as well as ensure actual implementation. Strategy can be broken down into four distinct levels (Corporate, Global, Business, and Functional). The following describes the details of each. Answers the question "What value should be created in what industry?" This can include the acquisition or divestment of other companies. Shows how to gain advantages over/with competition by competing internationally. 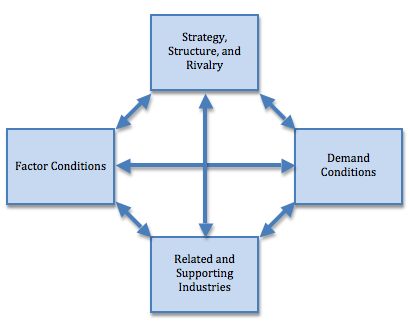 Helps identify strengths and weaknesses of international competition. Porter created a theory of "Competitive Advantage of Nations" that is described by the following diagram. It introduces relationships between global factors that must be synchronized to gain global advantages. What are demand differences in different countries? Can capabilities and resources be developed and used more effectively in other countries? How does a specific international culture affect competition? How are the wants satisfied? Finally, it is extremely important to acquire feedback from all strategic levels, and send it back to the top. This is how missions, visions, values, and goals can be refined and become even better inputs to new corporate, global, business, and functional strategy.